The 4* All Inclusive Blue Bay Hotel is situated 25 kilometres west of the Heraklion International Airport & is close to the fishing village of Agia Pelagia. The Hotel Overlooks one of Crete?? ?s most beautiful bays ???Mononaftis???. 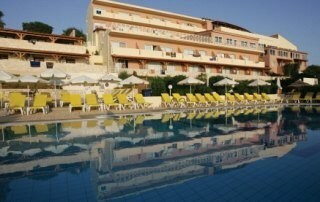 It is also near to the Sofitel Capsis Convention Center in Agia Pelagia. All rooms are fully equipped with private bath or shower, mini-refrigerator, satellite TV with international channels, air-condition (or heating) with individual control, private safe (with charge), direct dial telephone, hair dryer, balcony or terrace. All rooms have sea view. ***Some facilities and sevices are subject to a local charge*** There are 2 restaurants & 3 bars for gusts to enjoy; The Amvrosia is the main restaurant with Panoramic views and serves buffet syle Breakfast,lunch & dinner. Dionysos is the main bar with spectacular view of Mononaftis Bay.